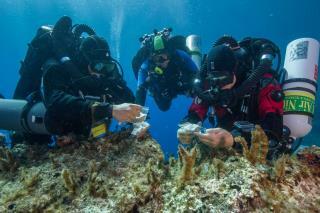 (Newser) – The Antikythera shipwreck is a gift that keeps on giving. First discovered in 1900 by sponge divers and dating to about 65BC, it has been explored multiple times in the decades since, including in 1976 when Jacques-Yves Cousteau and his crew surfaced with almost 300 objects, including human remains. Now a May 22-June 11 return to the shipwreck off the Greek island of Antikythera in the Aegean Sea has yielded 60 new artifacts, including a gold ring, luxury glassware, and a bronze spear that would have been part of a statue. The Woods Hole Oceanographic Institution, which led the effort with the Hellenic Ministry of Culture, also flags one particularly unusual item that may have served to protect the ship from pirates. The lead and iron artifact weighs about 220 pounds and is believed to be what's known as a "dolphin," reports the Huffington Post. The idea is that it would be dropped from high up on the mast onto an enemy ship's deck. Human remains from 65 BC? What were humans made of back then, plastic? Wow, that is really convenient that the artifacts were already in little zip-lock baggies on the ocean floor. It certainly saves time in the collection process.